HTC launched its flagship Android phone, Sensation, in India. The phone, which sports a 4.3-inch qHD (960 x 540) screen, runs on a 1.2 Ghz dual-core processor. It's the third dual-core smartphone to be launched in India after Samsung Galaxy S II and LG Optimus 2X. 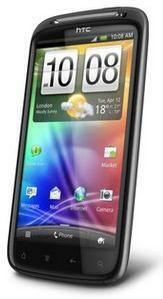 HTC Sensation has been priced at Rs 32700, which makes it cheaper by Rs 190 when compared to Galaxy S II. However, this is the MRP and in the market both phones can be purchased for around Rs 30,000. HTC says Sensation has an 8 mega pixel rear camera with dual-LED flash. The phone can play as well as record 1080P videos. It has 1 GB internal storage and 768 MB RAM. The phone runs on Android 2.3 (Gingerbread) that has been customized by HTC with its proprietary interface called Sense 3.0. At the launch event in New Delhi, HTC claimed Sensation has been designed to provide "superior multimedia" experience to users. The phone's screen has an aspect ratio of 16:9 which means that most of widescreen films will fill the entire screen and will not have black bars under and above the video. The phone also comes with "instant camera capture". This enables faster shutter speed, allowing users to click photographs "faster". In terms of specifications, Sensation compares well to Samsung Galaxy S II. However, we will reserve our verdict until we get our review out.